Yesterday reached a balmy 3° (felt like -15°)... Lovely, right? It is exactly the kind of weather that I long for. The type of weather where you go outside with two pairs of long-johns underneath your jeans, a pair of mittens hugging tightly to your hands, a scarf strangling your neck, the hairs in your nose freezing, the skin on your cheeks hardening as it is hit by the winter wind. For the first time this winter, signs of Chiberia quickly appeared. This is the type of winter weather that I have come to expect while living in the Midwest. Mild temperature and lots of sun? No, that is not quite realistic. So, for me to get my hopes up and wish that our mild winter would last is nothing but a foolish dream. After my walk home from church, I desperately needed something to warm my insides and prevent permanent hypothermia. I knew immediately that I needed some sort of comfort food. Soup. Sloppy Joe's. Brisket. Chili. Yup, that was what I would do. Make chili. Browsing my kitchen cabinets and refrigerator, I quickly gathered the necessary ingredients to whip together the perfect afternoon meal. Only problem? No ground beef. Solution to the problem? Ground elk. In all my years of making chili, I have never attempted making an elk chili. Nothing like the present. The gaminess of the elk. The combination of spices. The subtle crunch of the onions. The kick of the jalapeños. The entire meal came together in a marriage of epic proportions. Today I can only be thankful that I had the willpower to withstand eating the entire pot. Hello lunch and dinner for the next three days! Roughly slice half the yellow onion, put in a container, cover with water and place in the fridge for later. Soak the ancho chili in the beer. When it is soft, remove the stem and seeds and chop. Save the beer. Heat the oil in a large pot on medium-high heat. Add the elk, season with salt and pepper, and brown it for 7-8 minutes, until the pink is gone. Chop the remaining 1/2 onion and add to the pot. Cook for several more minutes, then and the garlic and cook for an additional 2-3 minutes. Add the cumin, chili powder, paprika, tomato sauce, ancho chili and beer and the rinsed beans. Dissolve the masa harina in the beef stock and add to the pot. If it's looking really thick (it should be a little soupy at this point) add some more beer. Let the chili simmer until you are ready to eat. When it's time, pull the onions out of the fridge, drain the water and pat them dry. Chop them. 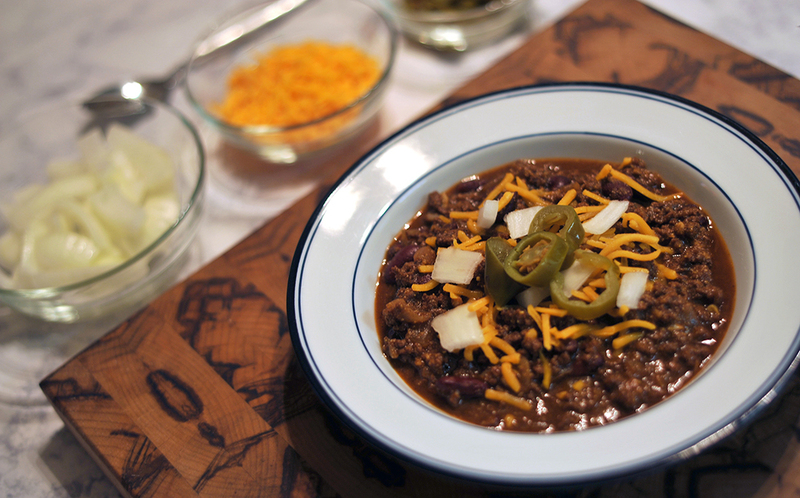 Serve the chili topped with cheese, onions, jalapeños.